I love these cars as there’s nothing for the money which will give the same luxury, elegance, power and handling combination. Almost as quick as a V8 BMW M5 (quicker actually for everyday driving) and will show a standard Impreza Turbo a clean pair of heels on a straight road. Effortless to drive and waft around in everyday. Even the mpg isn’t bad – 20-22 everyday; 27-30 on a run. Parts are inexpensive also – eg front discs and pads £90; full twin stainless exhaust only £350. And they’re going up in value as they become collectable. Note that these are a different beast to the earlier 322bhp XJR6 – the performance is is another league and if you’ve never driven one, it will blow you away! Most desirable colour – anthractite black metallic with ivory leather and biscuit trim. 99k with FSH. Just MOTd and 4 months tax. Jaguar handbooks/leather wallet etc included. VOSA MOT history to warrant the mileage. HPI-clear, warranted. Great bodywork, largely rust-free and looks superb. 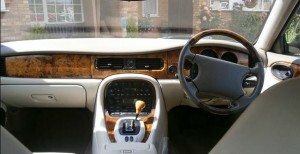 The interior is lovely and clean and tidy, very bright; a lovely place to sit even if you’re not actually going anywhere! Mechanically I can’t fault it – it pulls really well in all gears, stops straight and cleanly. Just had a pair of f anti-roll bar bushes so nice quiet suspension, which is rare! XJR fans will know how strong these cars are, unlike the XJ8. This example has drilled vented disc brakes with ‘Brembo’ logo’d covers. It also recently has had new tyres all-round. I’ve just done a 300-mile run in it and it was effortless – I could easily have turned round and driven back. Twice! These cars are amazingly quick when you need it with superb handling and body control, yet a pleasure to just waft too. A car which you can take the family out in or do the shopping or go on holiday, but which will match a BMW M5 V8 in power. Classic, timeless looks with modern reliability and cheap parts (eg a full stainless exhaust’s only c£250; f discs and pads c£90 delivered!). It’ll even double as a wedding car! This car looks good in Anthractie Black Metallic with ivory leather and biscuit carpets. Admired and commented on by all the neighbours! The XJR is a model which always looks well, classic lines with time-less appeal. 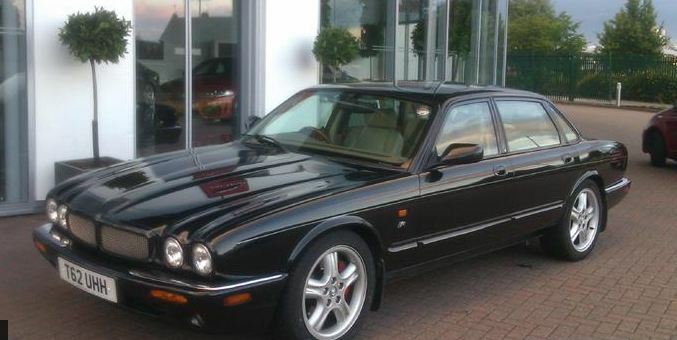 Overall, a very tidy and presentable Jaguar XJR for sensible money, which should look good and be reliable for a long time to come. A useable super-saloon which you can enjoy straightaway…and a great investment with the values starting to rise. I have quite a few XJRs in various specs/colours/trims/years/mileages, all I hope fairly priced, so if you’re after one I’ll do my best to help or advise as I do love the things!!! No part-exes thanks. UK delivery an absolute pleasure at cost price (just the fuel at 30mpg and train fare home, eg Southampton £130.) – as I really enjoy driving these cars!